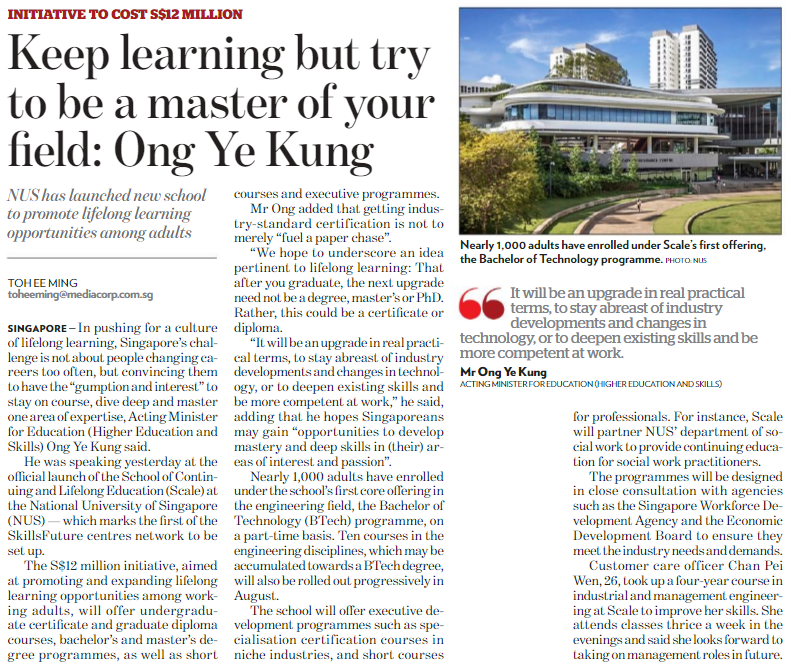 “The school will offer executive development programmes such as specialisation certification courses in niche industries, and short courses for professionals” (Keep Learning But Try To Be A Master Of Your Field: Ong Ye Kung, Toh Ee Ming). Yet to reach more Singaporeans, especially those who may not be convinced to obtain industry-standard certification, companies should be engaged to also train and develop their employees. Government endeavours to encourage lifelong learning – such as the new School of Continuing and Lifelong Education (Scale) at the National University of Singapore (NUS), the first of the SkillsFuture centres network offering “executive development programmes such as specialisation certification courses in niche industries, and short courses for professionals” (TODAY, Jun. 18) – may be constructive. After all nearly 1,000 adults have enrolled under Scale at NUS, and given the diverse opportunities more should take up programmes and courses in the future. Yet to reach more Singaporeans, especially those who may not be convinced to obtain industry-standard certification, companies should be engaged to also train and develop their employees. Company buy-in – especially if their involvement is more direct, through in-house sessions in the multi-national corporations or outsourced workshops in the small and medium enterprises (SMEs), for instance – will be more productive for two reasons. First, the relevance of curriculum. Whereas present programmes are often “designed in close consultation with agencies such as the Singapore Workforce Development Agency and the Economic Development Board to ensure [programmes and courses] meet the industry needs and demands”, companies themselves may have a better understanding of economic trends, and therefore the corresponding skills and knowledge workers need to master to improve productivity. What is perhaps necessary is to convince SMEs that these investments will field future dividends, or to provide some initial assistance. Second, companies can facilitate both logistical and administrative arrangements. A common lament from employees – who have to balance work and family commitments – is the lack of time. If employers recognise the value of better-trained and highly-skilled workers, then a proportion of working hours can then be devoted to the relevant programmes and courses. Moving ahead, what will also be useful is more information on the part of employers and employees. For the employers: how many companies now offer training and development, which types of arrangement have been made available, and what – through first-hand perspectives – are the benefits? Along this tangent what are the challenges or concerns, and how have they been addressed? For the employees: how many workers are now attending programmes and courses, to what extent have they been encouraged by their companies to do so, and on the other hand what are the reasons for not doing so? In this chase for more lifelong learners, having a handle on these issues will allow for more informed decisions, and even provide indicators to track the effectiveness of government endeavours.